← Will these creepy pictures of Sebastian Gorka magically get him fired? 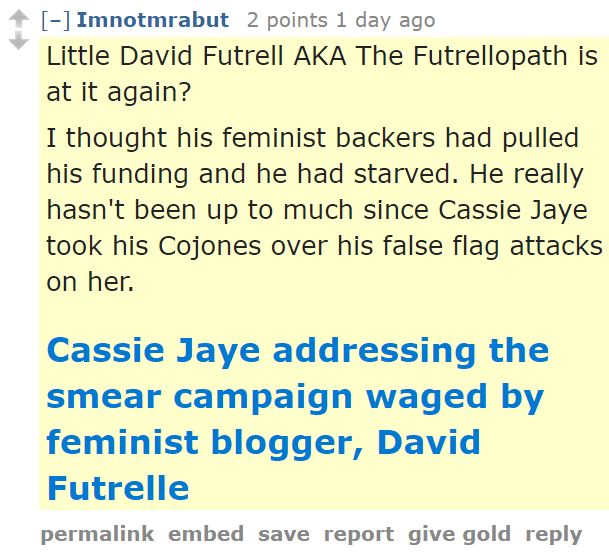 For Imnotmrabut, everything somehow revolves around Cassie Jaye, who apparently has confiscated my testicles. This ingenious fellow challenges my argument that there are deep connections between MRA thinking and the ideology of the alt-right by calling a dude getting pepper-sprayed in the face by a notorious white supremacist a “thug.” I have to admit that I did Nazi this rebuttal coming. I may never recover from this intellectual assault. Have you been saying bad things about Cassie Jaye on Radio Gleiwitz again? I am currently reading the looooong piece about Atlas Shrugged that one of the commenter linked. It’s fascinating to see the similarity in the arguments, like how being ugly is related to one’s worth and morality, or how they take subjectives things like ridiculousness as objective and rational argument, or the black and white mentality where if someone is against a part of your ideology he is your moral opposite on everything. I guess Ayn Rand is a MTGOW, but with some trace amount of litteracy skill. Ah, they really don’t like the fact that the similarities and connections and comparisons are being made. Men’s Rights “Activism”: the gateway drug to awfulness. They can’t seem to get that the world at large doesn’t care about their fourth rate video. So a guy who used to write for a Voice for Men may or may not have ties to the MRA? How’s that? I’d say he was waist deep in MRA. @David I really don’t know how you do it week after week, but I hope you are able to not take this crap to heart. You are an awesome person, and you often brighten my day with your posts. As most days, they are full of bovine intestinal material. Ayn Rand isn’t an MGTOW, she’s just a terrible “philosopher” they like. I know that as a women and from a period prior to MTGOW, she can’t litteraly be part of the MTGOW. It’s more about pointing the fact they are extremely similar, down to the threat of founding their own society to not have to deal with the fraction of mankind they dislike. Yeah, Ayn Rand and MGTOW are both cut from the same “the world refuses to recognize my obvious superiority, so I’m taking my bat and ball and going home and you’ll be SORRY” cloth. As for the Redditors, those are some primo third grade insults in the comments. Burn Level: E-Z Bake Oven. 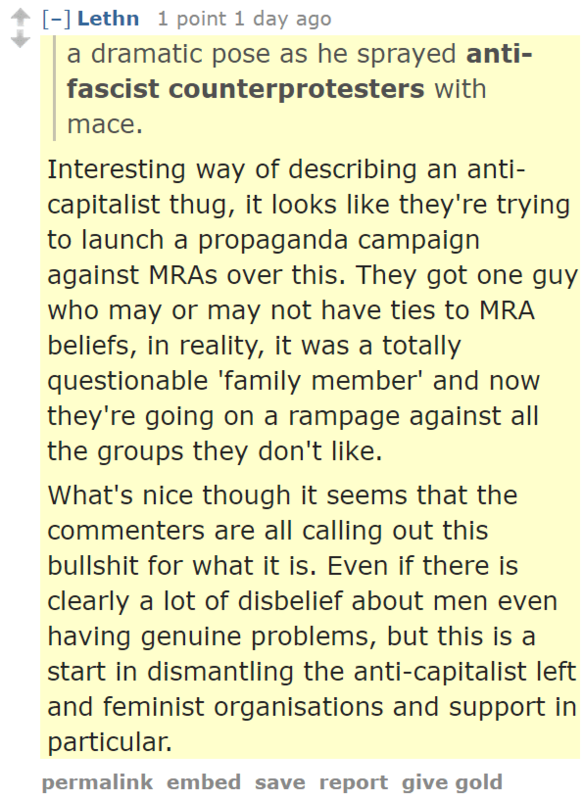 The MRM no true Scotsmans so much that there isn’t actually a single true MRA these days. I recently had a bit of a run in with some of Sargon’s followers. I appreciate this sort of thing is so much less threatening for a guy, but their attempts at ‘doxxing’ and harassment are so pathetically bewildering it’s almost adorable. So basically, they didn’t rebut your statements in the slightest. Unsurprising. Turns out that founding a society on Randian ideals doesn’t work well. Can’t find the link right now, but there was an attempt to do that somewhere, which went straight from “Galt’s Gulch Chile” to “Fraud Charges”. Yeah, if they’re not calling us “snowflakes”, they’re happy we’re “crying”, or calling us the “radical left” who are apparently also “fascist”… Then they like to mention the “political bias circle” or whatever, where if you go far right, you get authoritarian, and if you go far left, you get authoritarian. Conveniently ignoring that, by most other country’s standards, main US parties are both almost entirely on the “moderate to far right” side of the scale. Ooh, they caught David being large. As everyone knows, David’s size is a refutation of any argument he might make. They also say he is “starving” for lack of funds… They lack internal consistency, much like a cheeto or wotsit. How they ever thought that they could trust each other when they worship selfishness and hate generosity is beyond me. I laughed a lot. It’s obvious: we should only listen to arguments from people who are as attractive as George Clooney and Amal Alamuddin… oh, hang on, they’re kind of liberal, aren’t they? Dang, this ranking arguments according to the pulchritude scale is more complicated than I thought! Really strong rebuttals there, it’s almost like they don’t have anything intelligent to say. “Fool tell”? That would’ve been weaksauce in even first grade. Oh gourd, I hope it’s not a first-grader who actually posted that. She was a very old French woman who’d survived WW2 and a stroke and so I thought, “Wtf? Why did she make me slog through that crap?” I was incensed that she’d suggested it to me but her sly smile when I came back with notes and rebuttals and a presentation (for her) after I read it told me all I needed to know. Also, yes, David, you’re awesome. I can barely even log onto Facebook nowadays (and I only have dear friends there) so I value your work. Funny; Since some of these guys are overweight, themselves. Ah! The Anti-Intellectual jerk: If ya can’t persuade or refute, just insult or assault. Such “Specimens of Enlightened Humanity”!…..NOT! Jerks like Rand needed to understand that humanity evolved and grew via cooperation and not “Look out for Number One”! I also state what C Williams and Krasnaya Koshka stated. The AWESOME is strong with this one! I went in expecting whiny edgy teenagers calling David a cuck. Instead it’s just the usual man babies acting like babies. Can’t say if I’m disappointed or surprised. I always love how hyperskeptical these guys get whenever one of their own does something terrible. 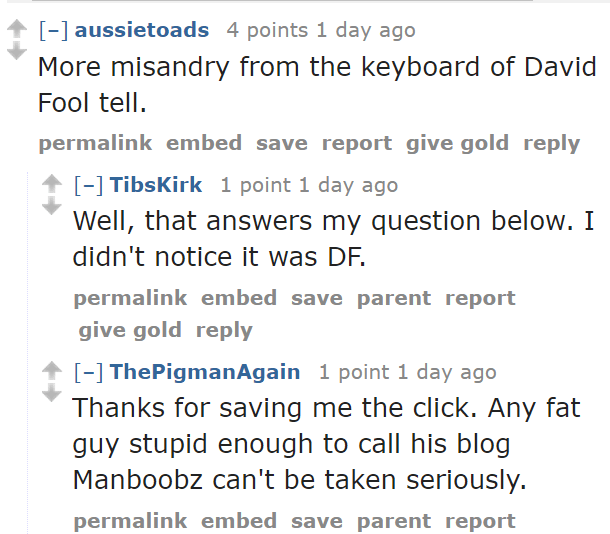 There’s a reason “I’m not an MRA but…” is a thing, and it’s not just that guy’s clever username. This is standard operating procedure for the Deplorables going back to Bush, but we saw that a lot with Gamergate. Labels mean having to actually having to own the indicated set of values and that’s why so many with unsavoury values get so bent out of shape at being labeled as their stated values dictate. “How dare you call me a right-winger just because I oppose immigration and multiculturalism? !” Hmm, probably cuz the right wing around the globe has made racism and xenophobia one of its universal platforms. It’s one of the things that actually drew me into the social justice sphere. Folks can say what they will about tactics, but feminist, LGBT, trans and anti-racist activists lead with their values and don’t budge when it comes to questions of people’s safety, identity and prosperity. Values count for a lot and if there’s one thing that really irks me is when people try to obfuscate their values so as not to have to defend anything (like claiming to stand for “free speech” as a concept but only coming to the defense of terrible speech). The Manosphere and their white nationalist cousins seem to have difficulties reconciling their abhorrent values, hence all the code words and rationalizations (“you call anybody who disagrees with you a ‘white supremacist! '”) Nope, we’ve just seen this movie often enough to know the talking points. Don’t want to get called that? Stop talking and acting like them. Ayn Rand is an EGTOW, everyone go their own way AKA I’ve got mine so screw you. And she ended up on medicaid so she was also a hypocrite. Clearly ThePigmanAgain has never heard of the concept of self-deprecating humour. As a Canadian, I always say that self-deprecation is the cornerstone of Canadian humour. After all, nobody else takes us seriously, so why should we? @simon that must mean Ego going there own way? AVfM seems to be the starting point for quite a few nazis – what about Judgybitch, who has gone full-on nazi on her own page (as documented by david) ?